[Episcopal News Service] The Diocese of Western Kansas elected the Rev. Mark Cowell on May 5 to be its sixth bishop. Cowell, a lawyer who once prosecuted gang members in Dodge City, is the vicar of Sts. Mary and Martha of Bethany in Larned, Kansas, and Holy Nativity, Kinsley. He still works part time as Dodge City’s municipal prosecutor and was just elected to his second term as the Hodgeman County attorney, according to his biography here. The other two nominees were the Rev. Mary J. Korte, rector of St. Stephen’s, Wichita, and the Rev. Jonathan Singh, clinical manager of St. Leonard’s Hospice in York, England. The electing convention was held at the St. Michael’s Episcopal Church in Hays. Cowell’s wife, Julie, is a district magistrate judge, and they are parents to three children: Gabriel, Cathleen and Gryffin. The Cowell family has lived in Larned since 1996 after they moved out of Dodge City because gang members there shot out his car windows. Cowell says in his biographical statement that he felt a call to ordained ministry after he finished law school in 1994. 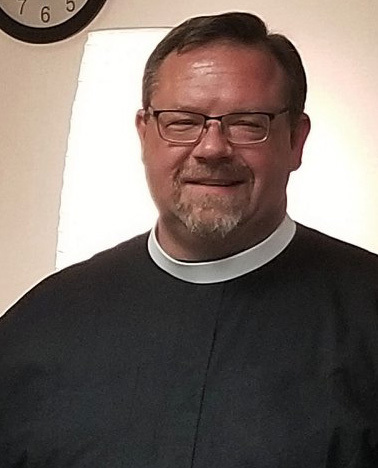 Because of his debt from that schooling, he was trained locally and, after several years of study, was ordained as a transitional deacon in October 2003 and as a priest in June 2004. While helping oversee the process that resulted in the election of current Bishop Michael P. Milliken, Cowell met with then-Presiding Bishop Jefferts Schori to discuss the idea of a dual-role episcopacy in which a person serves as both bishop and a congregational priest. Milliken lived that model, the first in the Episcopal Church in the past 150 years, until the end of 2014 when he resigned as rector of Grace Episcopal Church in Hutchinson to served full time as bishop, according to the diocese. Cowell has said he would continue serving both parishes if he was elected bishop. After the bishop-elect receives the canonically required consent of a majority of the Episcopal Church’s diocesan standing committees and bishops with jurisdiction, Presiding Bishop Michael Curry will ordain and consecrate the new bishop Dec. 1.